Outline: Illustration of man and oxcart going in the dark, coming to crossroads and not knowing which way. Compares with journey of life. Only one road leads to God. Refutes idea of all roads leading to God. Jesus the only one who can lead us. All others lead to hell. A man driving an ox cart bumps along a country road. It is night and very dark. Suddenly he sees that the road branches. He does not know which road to take. He is bewildered. At last he chooses a road. He shouts at his oxen, and beats them with a stick as the cart's wheels slip in the deep ruts. The oxen stumble in the rough road. They cannot see where they are going. Where is the driver of the cart going? He doesn't know. He has left his village and is looking for a better place to live. There is sickness and fighting in his village and he does not want to stay there any more. He hopes he has chosen the right road. He hopes there are no robbers on this road. He hopes it will take him to a good place. Our lives are like a journey through life. But do we know where we are going? Or are we like the driver who chooses one of the roads without knowing which is right? We should know whether we are on the right road or not. When the journey through life is over we cannot travel it again. The road of life is full of sin and sorrow. (Satan and evil spirits are like robbers lying in wait to rob us of our happiness.) Satan tries to deceive us so that we will choose the wrong road. 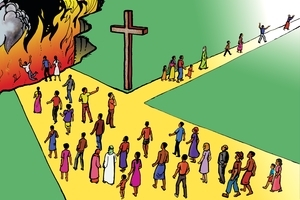 Some will ask, "But don't all roads lead to God?" No, many roads lead to sin and hell. In hell, Satan's place, men are separated from God forever. There is no way of rescue from hell. How can you find this way to God? You must believe on Jesus, repent of your sins and Jesus will lead you in the right way. Those who find this way are full of joy because their sins have been washed away. By believing and following Jesus they have found the good road that leads to God and happiness forever. No one can walk this road except those who believe in Jesus and follow Him. But listen: This road is narrow; it is difficult to follow. Indeed, it is impossible without the help of Jesus. It is holy (good); it is full of joy. Jesus, God's Son, will take you on this good road if you believe and trust in Him. Repent of your sins. He will cleanse you and give you the gift of everlasting life. He gave His life to rescue you from the road that leads to hell. He died to pay for your sins. Jesus receives everyone who accepts Him. Your life will be changed. You will walk no longer in darkness. You will no longer follow sin and Satan, you will follow Jesus only. GRN has recorded a version of this script in 273 languages and dialects. See full list.